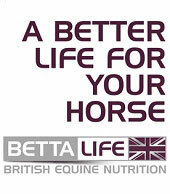 The UK's leading Equine Health and Well-being magazine for the professional. Every issue of the magazine is mailed directly to those whose profession makes them responsible for the health, well-being and treatment of horses every day. 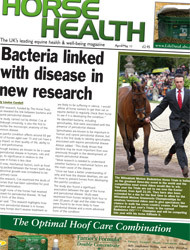 Horse Health's core readership is made up of the industry's decision-makers - the people with significant buying power at riding schools, livery yards, training schools, bloodstock agencies, veterinary practices, breeders and competition yards. 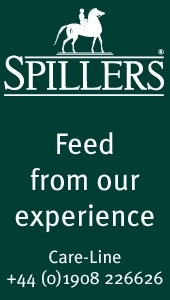 We are proud to have the support of Annabel Shields, GB Showjumper and British Showjumping National Champion 2017. Annabel has been using the product Bettalife' PharmaQuin Joint Complete HA for six months now with her horse Wet Wet Wet. Bettalife' PharmaQuin Joint Complete HA is our equine joint supplement which contains the highest levels of Glucosamine, Methyl Sulfonyl Methane, Chondroitin and Hyaluronic Acid on the market today. Bettalife PharmaQuin has been formulated to contain optimal quantities of every single ingredient, ensuring your horse achieves the best possible results. Unlike other products, Bettalife PharmaQuin also contains a unique component - Bioperine. This increases the absorbance efficiency of the supplement to ensure your horse gets the maximum benefits from every scoop. 'Every older horse can benefit from having Bettalife PharmaQuin's joint care supplement to help maintain the spring in their step and jump'. Whilst Wet Wet Wet has been using Bettalife' PharmaQuin Joint Complete HA the pair have won the British Showjumping National Championships in August; which Annabel claims has been their biggest success of the year. The course was up to height and proved difficult for the forty-nine competitors who entered the class with Annabel and just three other riders clear after the first round. However, Annabel rose to the challenge with an incredibly fast jump off finishing clear in a time of 44.12 seconds, winning her the title. The fun doesn't stop there though. Annabel has an exciting few months ahead competing at the Horse of the Year show in October and Roosendal in December. 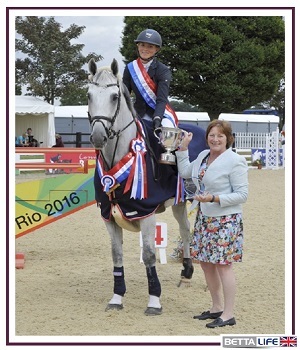 We are also looking forward to seeing her at the Liverpool International Horse Show at the end of the year. DeMaria JE, Lerant AA and Freeman ME. (1999) Prolactin activates all three populations of hypothalamic neuroendocrine dopaminergic neurons in ovariectomized rats. Brain Res. 837 pp.236-241. Geor R (2010). Digestive strategy and flexibility in horses with reference to dietary carbohydrates. In: the impact of nutrition on health and welfare of horses, EAAP 128. 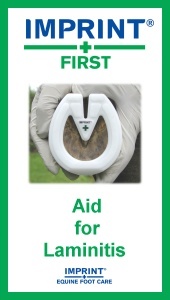 Grenager N (2010) How does Cushing’s Disease relate to laminitis? Advances in diagnosis and treatment. J Eq Vet Sci, 30 (9) pp.482-490. Glover CM, Miller LM, Dybdal NO, Lopez A, Duckett WM and McFarlane D (2009) Extrapituitary and pituitary pathological findings in horses with pituitary pars intermedia dysfunction: A retrospective study. 29 (3) pp.146-153. Lee Z-Y, Zylstra R and Haritou SJA (2010) The use of adrenocorticotrophic hormone as a potential biomarker of pituitary pars intermedia dysfunction in horses. The Vet J, 185 pp.58-61. McFarlane D., Cribb AE. (2005) Systemic and pituitary pars intermedia antioxidant capacity associated with pars intermedia oxidative stress and dysfunction in horses. Am J Vet Res, 66 pp.2065-2072. McFarlane D., Donaldson MT, Saleh TM and Cribb AE. (2003) The role of dopaminergic neurodegeneration in equine pituitary pars intermedia dysfunction (equine Cushing’s disease). In: Proceedings of the 49th Annual Convention of the American Association of Equine Practitioners, New Orleans, USA. pp.233-237. Orth DN and Nicholson WE. (1982) Bioactive and immunoactive adrenocorticotrophin in normal equine pituitary and pituitary tumors of horse’s with Cushing’s disease. Endocrinology, 111 pp.559-563. Schott HC. (2002) Pituitary pars intermedia dysfunction: equine Cushing’s disease. Vet Clin North Am, 18 pp.237-270. Saland LC. (2001) The mammalian pituitary intermediate lobe: an update on innervations and regulation. Brain Res Bull, 54 pp.587-593. Treiber KH, Kronfeld DS, Hess TM, Byrd BM, Splan RK and Staniar WB. (2006). Evaluation of genetic and metabolic predispositions and nutritional risk factors for pasture-associated laminitis in ponies. J Am Vet Med Assoc, 228. pp.1538-1545. Wilson MG, Nicholson WE, Holscher MA, Sherrell BJ, Mount CD and Orth DN. (1982) Pro-opiolipomelanocortin peptides in normal pituitary, pituitary tumor and plasma of normal and Cushing’s horses. Endocrinology, 110. pp.941-954.